Play our sweepstakes now for a chance to win a 2017 Mustang GT and spin to win on authentic slots including KONAMI favorites like China Shores! Experience casino luxury at Best Bet Casino – the new FREE casino. — Chance to win a 2017 Mustang GT in our FREE sweepstakes! — Earn points to redeem for prizes including Apple iPads and more! — Slot favorites including KONAMI’s China Shores and Gems Wild Tiles! — Play with friends to test your luck and earn more free coins! — Blitz through new bingo rooms with fun themes including Mardi Gras and 70’s disco! — Blast your way to more free coins with Tap Blast! — Gain achievements and complete collections to earn even more free coins! — Play slot bonus games, earn free spins, and win tournaments! 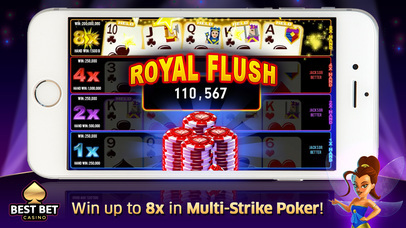 — Level up with world-famous Multi-Strike video poker! — Double down on Blackjack and win big! Play more, bet more, win more only at Best Bet Casino – the top new casino game! The games do not offer «real money gambling» or an opportunity to win real money or prizes. Bet Casino is intended for players 21+ for entertainment purposes only and does not offer “real money gambling” or any opportunity to win real money through game play. Playing Best Bet Casino does not entail future success at “real money gaming”.